As members of not just Dudley CC but also SWCC, Brendan, Mark and myself had been asked to help out on one of their 'Provisionals' weekends. Mark was unsure whether I'd be keen on spending Valentine's Day caving with unknown newbies, particularly as Brendan had already asked him out for a meal on Valentine's evening, but as we spent last year's Valentine's camped in a popular dogging spot near Abergavenny (accidentally!!) I figured this year's could only be an improvement. Claire Vivian of SWCC had done a tremendous amount of preparation for the weekend and groups were soon organised to go underground. 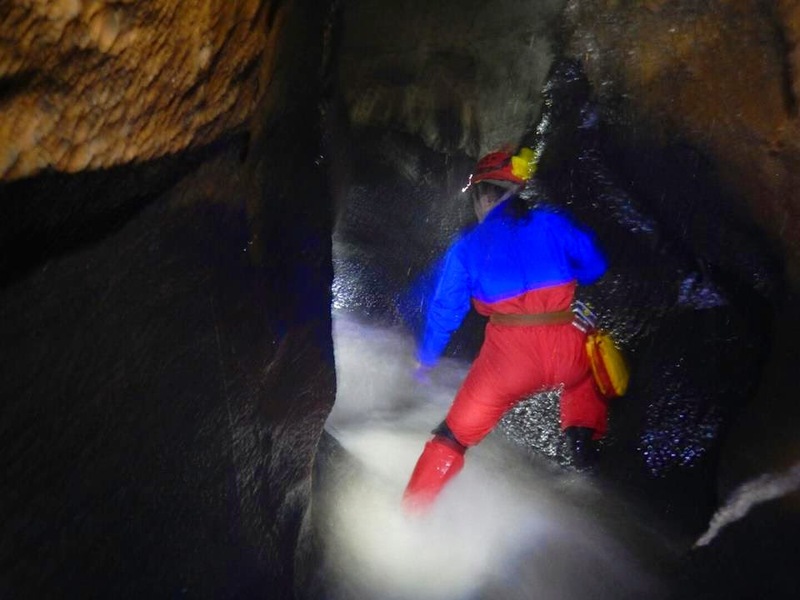 We were asked to take two groups from Southampton Uni - not strictly novices but inexperienced cavers who wanted to go further afield in the cave systems. I envisaged a romp around Top Entrance route-finding and was looking forward to the day. 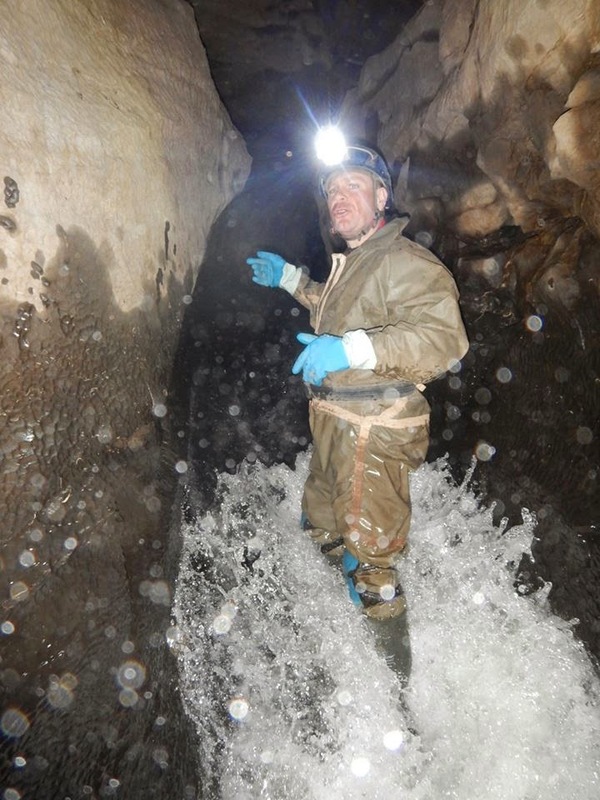 One of the groups wanted to go and find cave entrances in the more general area, such as Clydach Gorge, so that they could plan future trips, and it made sense that Brendan should show them where to look. The other group wanted to do something more demanding - a through trip from OFD1 to Top Entrance. Much as I tried to persuade them that the Marble Showers Traverses were the best way to do the through trip, they were determined to experience the delights of the streamway, and it was with a heavy heart that I waved Brendan off in his nice, warm car, and plodded down the hill to get wet. The water was well over the step when we got to OFD1, but not at a dangerous level so off we set. All went well for the first section and we quickly passed Lowe's climb and went through the boulder choke. OFD 1 1/2 through to the junction with Cwm Dwr posed no problems and we were even shown a new way to enter the Letterbox feet first, which works really well. "I think it's this way"
Once through the Confluence the streamway became really hard work. As I find the streamway hard at the best of times, I went first. The water was flowing so strongly that we had to fight our way up each cascade and find new ways to climb up the mini waterfalls. Then we arrived at the first pot. Whereas in the past I have happily skimmed across the surface of each pot and wriggled up the other side, now I was faced with a whirlpool. Following the swirl of the water it was easy to be swept around to the other side of the pot, but dragging yourself back out of the water against the flow was really strenuous, with the water trying to peel your fingers off the smooth rock. The last pot was the worst. I launched myself at the far edge but could not get a grip, and the water swept me straight round the pot back to where I started. Again I dived across and again the water pulled my desperate fingers off the rock. This time I was going under as I came back around the pot and two students pulled me out. One of them had a go at getting across the pot but ended up back at the start like me, and then finally the other managed to get across and pull himself out. I passed him a sling and he aided the rest of us across and out of the water. When it came to the last one in the group, he had no strength left to pull himself out, and Mark had to dive into the pot and push him out, dolphin-style. The water was also extremely cold, and by the time we reached the Oxbow and came out of the water our teeth were chattering. The students started emptying their wellies and Mark looked at them, "You do know we have to get back into the steamway, don't you?" he asked. I think I heard whimpering; it could have been me. Back in the streamway, we eventually reached the climb up towards Maypole Inlet. There was a fair amount of water coming down, and one of the students looked up at it. "Just what I wanted after all that" he said "was to have to climb up a f***ing waterfall!" The climb up Maypole Inlet itself proved a challenge for the weary group but soon we were all up into dry passage at last. Taking a short detour to take in the Trident, Judge and Swamp Creek on the way out, I elected to take the sandy crawls to the Corkscrew, in an effort to warm up, and took two of the group with me, while Mark continued up Salubrious with the rest. Once out of the cave we were thanked profusely by the students, who then had their dinner and went straight to bed, broken! Brendan had not long been back after a leisurely potter around the countryside, so he graciously allowed me to accompany him and Mark for a curry to round off the day. Definitely a better Valentine's than last year!